124. With much of the region’s attention focused on the EU accession process, a number of broader developmental challenges must be addressed to successfully move ahead, particularly among recent and future member states. The review shows how EU members, especially those that joined before 2007, have benefited from a generally stable policy environment and a steady stream of EU funding. Access in particular to wastewater services has increased, the performance of their utility companies is generally at par with international practices, and despite some concerns with regard to affordability, the financing of their services is sound, as well. However, some of the more recent EU members and candidates are facing a significantly different situation, with important basic services gaps especially among the most vulnerable, a focus on investment absorption rather than cost-effective solutions, service providers less prepared to assume the responsibility of developing and maintaining the necessary assets, underfunded services, and incomplete or unclear sector governance. The governments’ attention is understandably focused on the transposition of EU legislation and development of wastewater management infrastructure. However governments should also address a series of broader, but related, sector challenges to ensure that all citizens benefit fully from the EU accession process. Below is a summary of the key regional challenges identified in this report. A more nuanced and detailed discussion of each country’s specific challenges is included in the Country Notes that accompany this regional report and which are available on the SoS.danubis.org website. While service provision remains a local government responsibility in most countries, policy reforms accompanying the EU accession process tend to subject those services to increased national regulatory and institutional oversight, creating the need for clearer accountability mechanisms. After an initial wave of strong decentralization and local government empowerment in the 1990s, reforms explicitly or implicitly linked to the EU access process are increasingly reasserting the role of national governments, through the establishment of new national regulatory agencies in more than half of the countries in the last 15 years (led by Albania and Slovakia), and the various efforts to regionalize or aggregate service providers (led by Kosovo and Romania). In practice, though, implementation of those reforms has lagged. New regulators often struggle to extend their regulatory reach over large numbers of local public service providers and achieve meaningful regulatory outcomes. Sector financing strategies have not been developed upon adoption of the cost recovery principle. Utility companies and management continue to be largely driven by local interests. In many cases, those reforms have not yet borne fruit, and the analytical work done under the State of the Sector review shows that the long-term impact of such policies is still to emerge. While the EU accession offers a tempting opportunity (or excuse) to resort to regional recipes, governments would do well to look at the actual reasons that undermine the institutions’ ability to deliver on their mandate, and address those by establishing a clear responsibility, accountability, and incentive framework for service providers and local governments, before attempting far-reaching reorganizations. While wastewater management captures much of the public attention, there are 22.5 million people without piped water and 28 million without flush toilets in the Danube region; rural populations, the poor, and minorities are disproportionally represented among them (Figure 63). The centralized collection and treatment of wastewater is a clear objective of the Urban Waste water Treatment Directive, and many governments are focused on addressing it. However, as Figure 63 shows, although the overall level of access to water and sanitation services is high throughout the region, there are still important equity challenges in providing access to basic, good-quality services to all. For example, there are still 22.5 million people without piped water on their premises (the vast majority of whom use shared pipes, or have springs or wells in their backyards), and 28 million without flush toilets—with rural populations, poorer households, and minorities disproportionally represented. Even among those who have access to public services, the rapidly increasing tariffs have meant a particularly high burden on the bottom 40 percent and on the poorest share of the population, particularly in those countries where most unserved people live (Moldova, Romania). The unaffordability of tariffs could threaten the gains in extending access to all through infrastructure development, unless sound subsidy schemes are implemented. The performance of many service providers in the region still trails regional and international best practices, threatening the long-term sustainability of ongoing investment programs. While positive trends have been observed since the socialist period ended, progress appears to be stagnating in more recent years, and many utilities—the main actors ensuring sustainable services for all, at least in urban areas—remain short of operating at good practices levels (Figure 64). 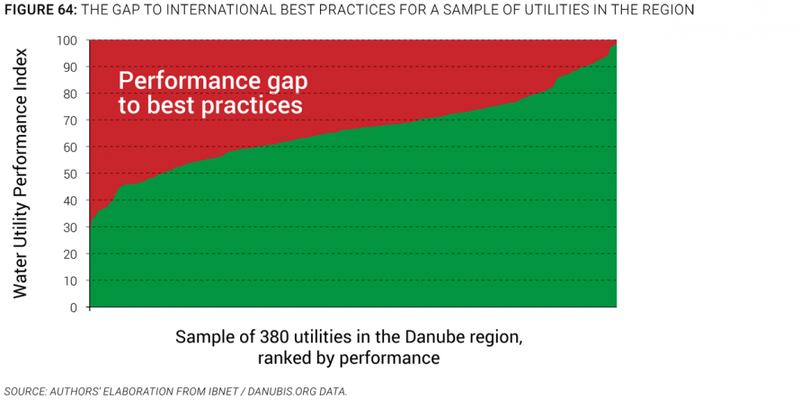 This report shows, however, that improved management practices can help mitigate the impact of increasing asset development and management costs, and that in most countries there are utilities that outperform their peers by a wide margin, independently of the sector’s organization and structure. Failure to address the performance of utilities will threaten the sustainability of the large ongoing investments in infrastructure, particularly for wastewater management. 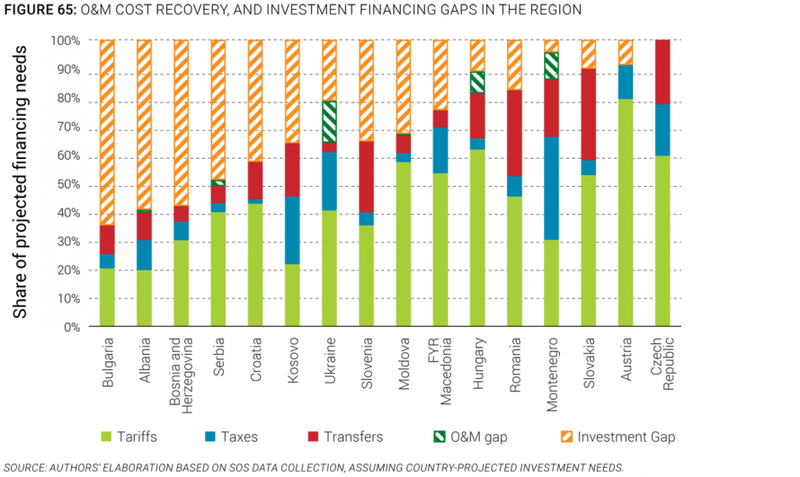 The sector’s overall financing framework does not guarantee universal, high-quality services in the long term. The Water Framework Directive and sound sector policies have led to the widespread adoption of the cost recovery principle in national legislation; however, many utility companies are barely recovering their operating costs from tariffs, and tariffs are widely set with limited consideration of the established regulatory frameworks. At the same time, this report shows that in most countries, there is still significant space for tariff increases without creating affordability constraints for the average household. The financing of investments, including from EU funds, is done in an ad-hoc manner, with transfers distributed with limited attention to equity and cost-effectiveness of projects, and taxes providing untargeted subsidies (Figure 65). The significant taxes and transfers going toward the water sector represent a missed opportunity for national governments to provide the right set of incentives to service providers. The estimated investment gap is around €2.5 billion a year, and investment levels in a number of countries are below the levels necessary to maintain and manage assets in the long run. Costs are expected to continue to rise rapidly in the future. In the absence of a sector financing policy providing the proper efficiency incentives to service providers on both operation and investments, coupled with clear, well-targeted subsidies to address affordability concerns for the poor, service providers will not be able to provide universal, high-quality services in the long term. More and better publicly available data are necessary for sound policy making, utility performance improvement, and management accountability. A recurrent challenge in many of the countries—surprisingly, particularly in more advanced economies including Austria or Slovenia, for example—is the lack of publicly available, structured, reliable, and representative data about the sector. In the absence of clear data and benchmarks, utility managers cannot assess whether their operation is on par with good practices. Without reliable sector financing information, policy makers lack a key instrument with which to promote sustainable services, and sector planners, in the absence of consistent data about access to services, cannot ensure that limited public funds go to those who need them most. Perhaps most important, given the significant amounts of public funds going to support water services, citizens, taxpayers, and their elected officials in many countries do not have access to transparent information to help them hold accountable sector decision makers at all levels.